The first signs of spring are popping up across town. 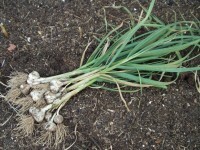 Irises are sprouting in the front yard and garlic is appearing in the backyard. We're still two months away from the last average frost date, but many of the hardier plants are showing new growth, swelling buds and sprouting leaves. I expect we'll still see some snow, even well past the Spring Solstice. But, that's life in the foothills of the Rocky Mountains. Fall is definitely here in the foothills of the Rocky Mountains. We've already had a couple of light frosts, but the forecast last night was for a hard freeze. My wife and I went through our garden for the last harvest of the season. 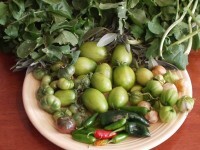 We harvested plenty of green Tomatoes, Ancho and Serrano chile peppers, Tomatillos, some of the more tender herbs like Mint, Sage and Basil and a bale of Arugula. The garden can be full of surprises. An interesting vine sprouted a few months back. Although I didn't recognize it, I decided to let it grow. 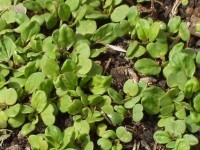 My theory is that with as many wildflower seeds as I've sown I try to give any new plant a fighting chance to prove it's not a weed. 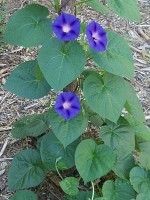 My bet paid off with a Morning Glory. 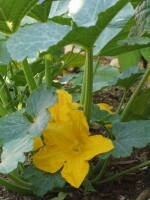 Blossoms on Delicata Squash (Cucurbita pepo) vines in the garden. Delicata (a.k.a. Sweet Potato Squash) is a heirloom variety with great flavor, but it is uncommon in the grocery store given its softer skin which doesn't stand up well to rough handling. 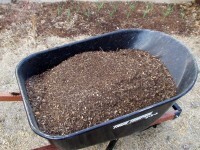 So far it's been pretty easy to grow for us and forms the base of our Three Sisters (corn, beans, squash) garden bed. Freshly harvested Allium sativum L. (i.e. 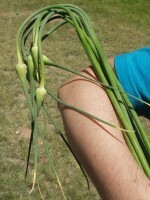 Bosque Early Garlic). I dug these bulbs up yesterday evening and they are now hanging up to dry. The laundry room is quite aromatic at the moment. 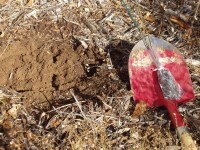 My wife informed me that we will be planting 'three times as many' after seeing the ten garlic plants I pulled up. I have no argument with that whatsoever. 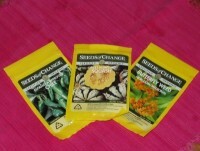 I may have to try a few different varieties like Spanish Roja or a hard-neck garlic.